Manufacturers--whether they make phones, tablets, TVs, or computer monitors--are always trying to convince you that their gadget has a better display than all the other gadgets. In doing so, they throw a bunch of fancy-sounding acronyms and technology terms at you: Super AMOLED. PenTile. LED. IPS. Super-IPS. Some of the hyped items are legitimate descriptions of new technologies, and some of them are just marketing buzzwords for minor tweaks. This guide will help you better understand how digital display technologies work, and what some of the major terms mean. At its base, the situation is actually simpler than you might think. You’re likely to encounter only three major types of digital displays: LCD, OLED, and plasma. We'll tackle them from least common to most common. Bear in mind that this article is a simple primer. As complicated as this stuff may seem, this discussion only scratches the surface. You’ll learn enough to make informed decisions about the products you buy, but digital displays involve a whole lot more than just the basics covered here. These days you find plasma displays only on very large HDTVs and digital signs, and LCD is starting to replace plasma even in those situations. Plasma displays have great contrast, with bright whites and dark blacks. Color reproduction is very good, and viewing angles are fantastic--plasma displays don’t shift color or brightness very much when you view them from the side--so they're ideal for public places such as sports bars. They’re also relatively inexpensive to make in very large sizes. The market used to see a huge price difference between a 50-inch plasma HDTV and an LCD of the same size, though that price gap has largely disappeared today. In addition, plasma displays have a fast response time (that is, they can change the color of a pixel quickly), which means less motion blur. Unfortunately, plasma has some disadvantages that keep it out of smaller devices. Plasma screens are too thick, heavy, and power-hungry to work well in smartphones or tablets. It’s also difficult to pack a lot of pixels into a small plasma screen, so small devices would suffer from low resolutions. On top of that, the technology produces a noticeable gap between pixels that can lead to the dreaded “screen door effect.” You can’t see it sitting 10 feet away from a big TV, but it would stand out on a laptop or PC monitor. 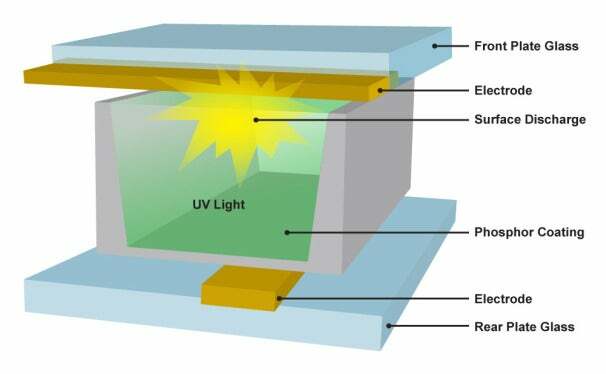 Diagram of a single cell in a plasma display. How it works: A plasma display consists of millions of tiny cells filled with xenon and neon gas, held between two plates of glass. Lines of electrodes run beneath all the cells, and perpendicular lines of electrodes run above them, forming a basic grid. The plasma display controller charges the electrodes beneath and above the cell it needs to light up, and the current passing through the gas in the cell makes it glow. In many ways, it works just like a tiny fluorescent light. The controller lights up the cells each in turn, in a fraction of a second, too fast for the eye to see. The light that the gas emits is actually in the ultraviolet spectrum and can’t be seen by the human eye, but each cell is coated with a colored phosphor--either red, green, or blue. Excited by the ultraviolet light, the phosphors emit visible light. In short, a plasma display has pixels made up of smaller red, green, and blue subpixels that work like little fluorescent lights, with an electric charge exciting a gas and causing a phosphor to glow. And it all happens millions of times a second.